SDSU has designated areas for free speech. As a journalism major, I would argue there is nothing greater our Constitution guarantees. But what happens when it turns into harassment? Where do we draw the line? When is it considered hate speech? Case in point: we have this extreme fundamentalist who has been coming to campus since I’ve been there, and maybe years before. He screams at our students. He calls them names, such as sluts, idiots, sodomites, etc. He tells them they are all going to burn in the lake of hell. Most students laugh at him as this crazy guy. But some students are truly bothered by him and feel harassed and threatened. How do we handle this guy without going down that slippery slope of outlawing speech we don’t like, or in fact, deplore? How do we handle the Westboro Baptist Church? Should we even try? I am interested in your opinions. Free speech is a right of every American, but unfortunately there is always a radical in every bunch and on every topic..We are all entitled to our own opinion but Radicals tend to think that they are the only right ones….Some.radicals have a tendency to harass and that is not a given right. That form should be illegal, it borders on that fine line. 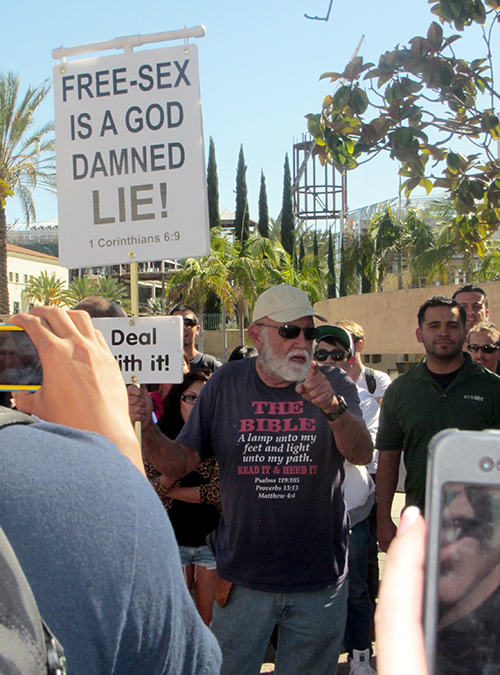 I’ve heard that man ranting on campus at SDSU. * shudder ‘n cringe * I’d never in a million years get up on a box and shout at other people that they’re doomed if they don’t think the way I do.